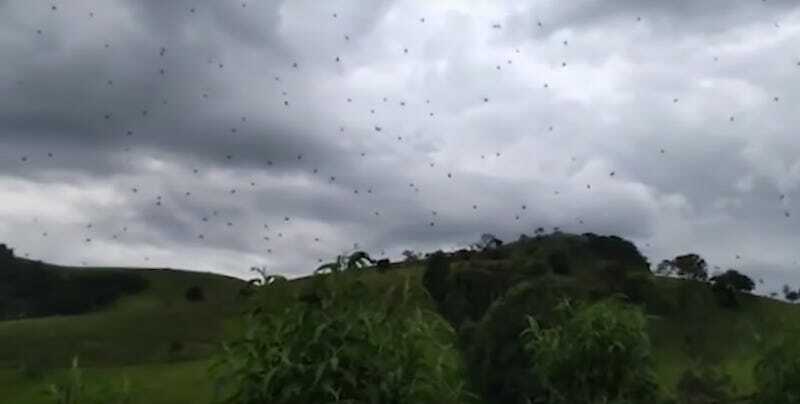 The Guardian on Friday reported recent accounts of such an occurrence in Brazil, where people have reportedly claimed it’s “raining spiders.” A video recently shared to Facebook of the phenomenon in the Brazilian state of Minas Gerais appears to show hundreds of spiders suspended in the air—like something straight out your worst arachnid nightmares. Terrifying as it may be, this is evidently something that is common of the species parawixia bistriata and occurs during hotter, humid times of the year, according to the Guardian, citing Federal University of Minas Gerais professor and arachnology specialist Adalberto Santos. These arachnids are reportedly social creatures who band together to make one massive web that they use to catch food. As for reports of “flying” spiders, that may be the result of behavior referred to as ballooning, Terra do Mandu reported. Incredible evolutionary achievement notwithstanding, any of us would be forgiven for being creeped the hell out by airborne spiders.